The turkey is done, the fixings are made, and the table is set, complete with candles and delicious delicacies. As you get ready for your holiday guests to arrive you hear… a crash, a bang, and then the smoke alarm starts to wail! In a panic you run downstairs to find that in the midst of it all is your furry friend with a guilty look on his face. The scrumptious smells that make all our mouths water are apparently doing the same to your furry friend. Lesson: It is wise to not leave meals unattended while your pets run around. In addition, it is very dangerous to leave candles lit around unsupervised pets. 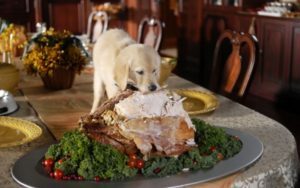 Although the ambiance is pleasing, the potential hazard is that your pet might knock into the candles in search of the coveted Thanksgiving meal. Not only do open flames pose a threat to starting a house fire but animals themselves can easily catch fire. With their hair acting as a wick, in an instant your pet could be in real danger. Be extra cautious during the holidays. It is easy to overlook dangers to your pets. For added safety confine your pet to a separate room when you can’t be there to monitor them. Enjoy the splendor of the holiday and your meal, and cheers to a happy and safe Thanksgiving for you and your pets!